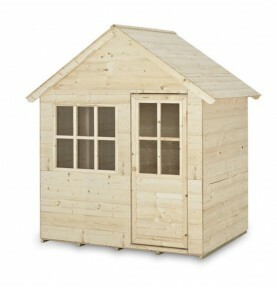 CASITA DE MADERA DE 1,06 M2. DIMENSIONES EXTERIORES 120 X 89 X 147 CM. INCLUYE SUELO Y DE VENTANAS DE PLEXIGLÁS. RÁPIDA INSTALACIÓN MEDIANTE PANELES PREMONTADOS Y ATORNILLABLES. MADERA DE PINO CON TRATAMIENTO QUE PRESERVA LA MADERA, SIN CAMBIAR EL COLOR NATURAL. SE RECOMIENDA EL USO DE PINTURAS NATURALES PARA SU PERSONALIZACIÓN.